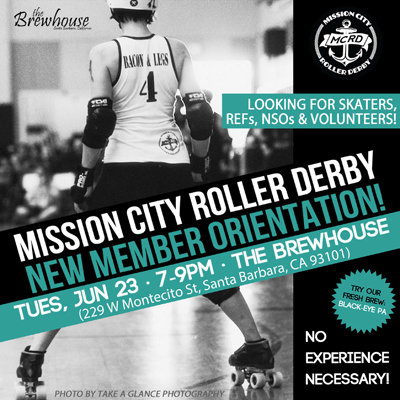 Mission City Roller Derby - New Member Recruitment Night! New Member Recruitment Night 2015! Open recruitment is happening NOW for new members joining in August. Come visit us on June 23rd at The Brewhouse to find out how you can get involved and drink some of our custom brew, the Black-Eye PA. We are collaborating with our friends at The Brewhouse to brew this original beer and $2 from every pint goes to the league. Drop in anytime between 7-9pm on Tuesday, June 23rd. If you’re interested and cannot attend or have questions about the event, please email membership@missioncityrollerderby.com. We’re looking for individuals who are curious about the sport of roller derby – no experience necessary! There’s a place for anyone who wants to skate, become an official or simply volunteer. We offer a full coaching staff to teach and coach skaters and members of all levels and we are currently a WFTDA Apprentice league with intentions of being a full WFTDA league by the end of the year. We think of ourselves a family and we’re always looking for more people to join! Skating: Little to no skating experience? No problem. We lovingly refer to our newbies as Nuggets and we’ll teach you skills ranging from starting and stopping to falling and hitting! Have some derby already under your belt? We’ve got a spot for you. Come show off your skills and we’ll gladly place you at the appropriate level with our A-team the Brawlin’ Betties or our B-Team the Vicious Veronicas. Officials: We can’t skate without the help of our amazing Derby Justice League. DJL includes skating referees and non-skating officials. Learn the rules and boss around the ladies on the track! Volunteers: Mission City Roller Derby is a 501(c)(3) non-profit run by volunteers. We depend on help from our volunteer corps to put on the excellent roller derby events we have become known for.